Rich, creamy, and cozy Roasted Butternut Squash Alfredo. The perfect meal for a cool, Fall evening and ready in one hour from start-to-finish. It went from nice Summer weather to cold here overnight. We even had a little bit of snow last week. And it’s the perfect weather right now – you can sport cute Fall boots, oversized scarfs, long sweaters and still enjoy a stroll outside before the streets are covered in salt and snow. And I am also excited to share this week’s recipe with you because cool, Autumn temperatures call for vegan comfort food like this Roasted Butternut Squash Alfredo. 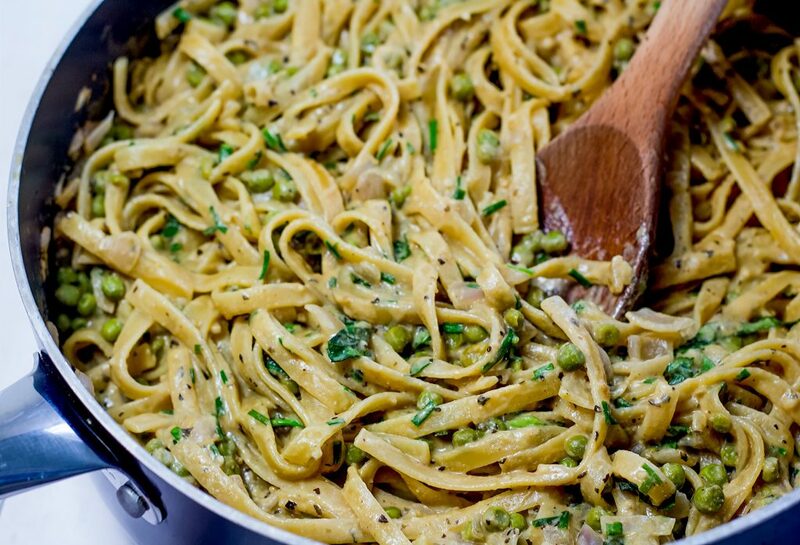 Pasta is the ultimate comfort-I-wanna-snuggle-up-with-netflix-and-my-puppy food. 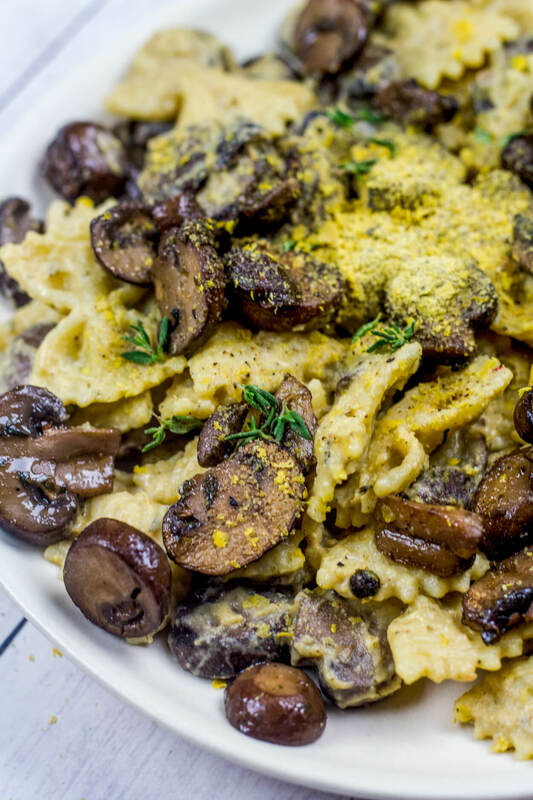 Pasta with caramelized, roasted veggies blended into a rich and creamy Vegan Roasted Butternut Squash Alfredo takes comfort food to an entirely new level. This Vegan Roasted Butternut Squash Alfredo is also easy to make. Roast the veggies, blend with cashews, spices, and water. 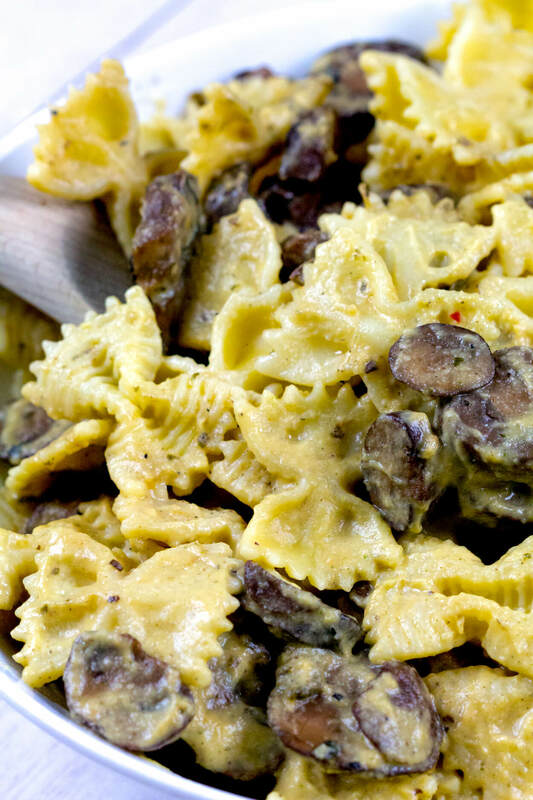 Stir into pasta with sautéed mushrooms. Hint, I use frozen veggies to make this recipe even easier. You don’t have to worry about chopping up a butternut squash! If you make this Roasted Butternut Squash Alfredo at home, take a photo and tag me #CearasKitchen on Instagram or leave your feedback below. 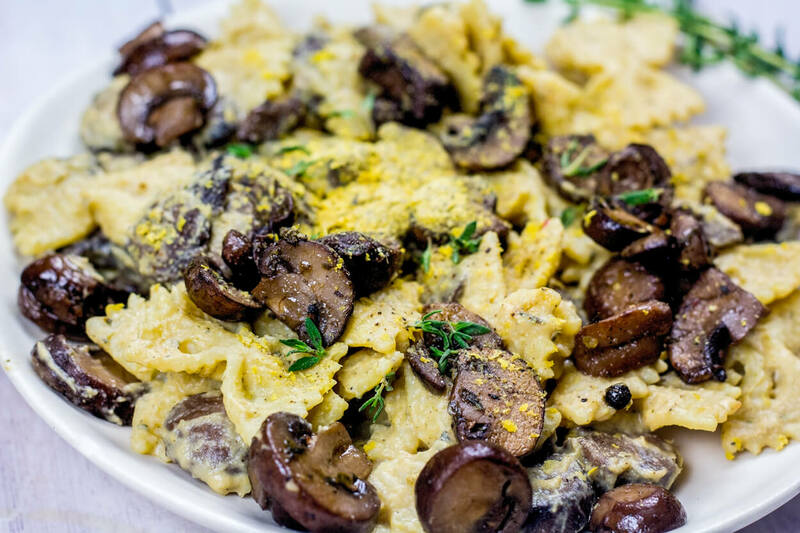 I add sauteed cremini mushrooms to this Roasted Butternut Squash Alfredo and they go perfectly with the deep and rich flavors in the sauce. The mushrooms are completely optional if you’re not a mushroom fan. I have a feeling fresh peas or sauteed leeks would go beautifully in this recipe as well. Garnish with vegan parm and dig in. Enjoy, xo! Preheat oven to 475F. Soak cashews in a large bowl in hot water. 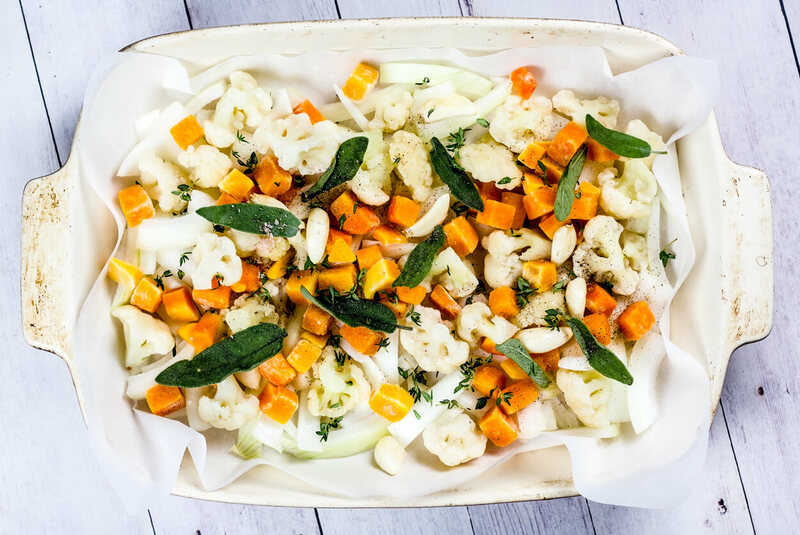 Roast the vegetables: Line a casserole dish with parchment paper. Add the chopped cauliflower, butternut squash, garlic, and onion to the casserole dish. Add the thyme and sage leaves on top of the vegetables with a pinch of sea salt and pepper. Roast the vegetables for 35 – 45 minutes until roasted and caramelized. Cook the pasta: Cook the pasta in a large pot of salted, boiling water. Drain and set aside. Prepare the Alfredo: Drain and rinse the cashews. Add the roasted vegetable, cashews, bouillon, apple cider vinegar, nutmeg, nutritional yeast, pasta water, sea salt, and pepper to the blender. Blend until creamy smooth. Taste test and add extra salt and pepper to taste. 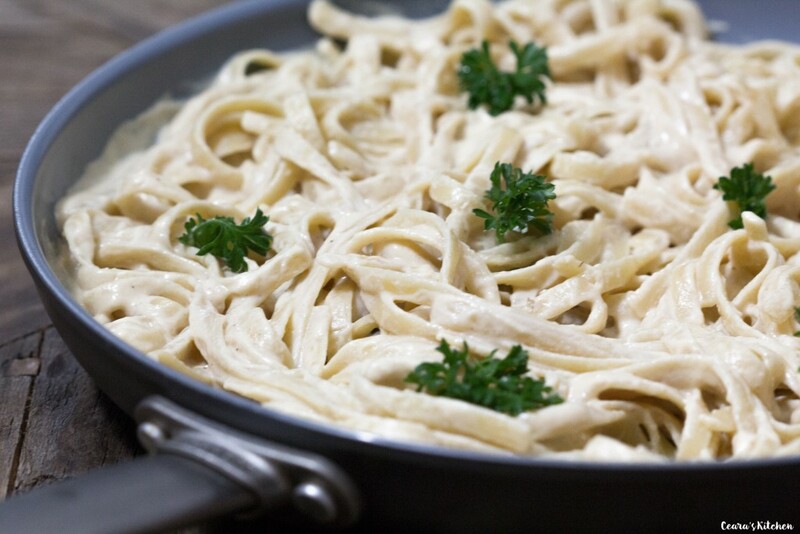 Add the Alfredo to the pasta. Stir. Add optional sauteed cremini mushrooms, leeks, or peas. Garnish with Vegan parmesan. Enjoy! 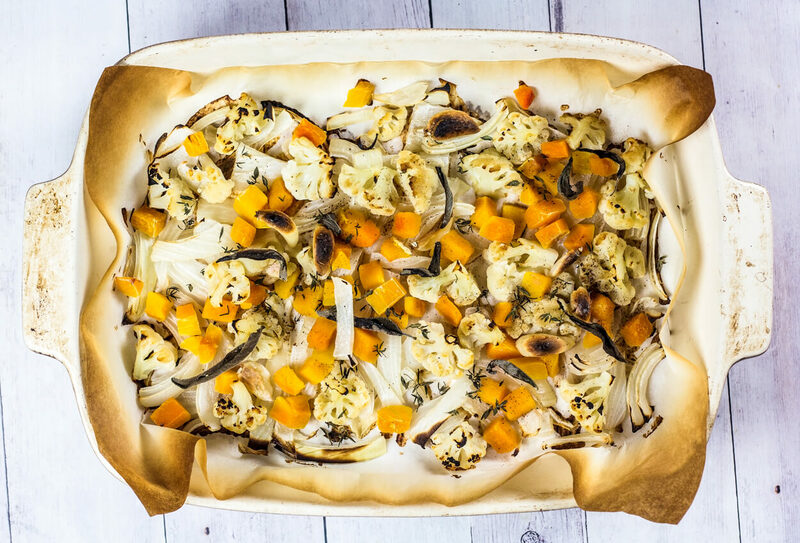 You can use frozen or fresh cauliflower and butternut squash in this recipe. Use gluten-free pasta for this recipe to be gluten-free. 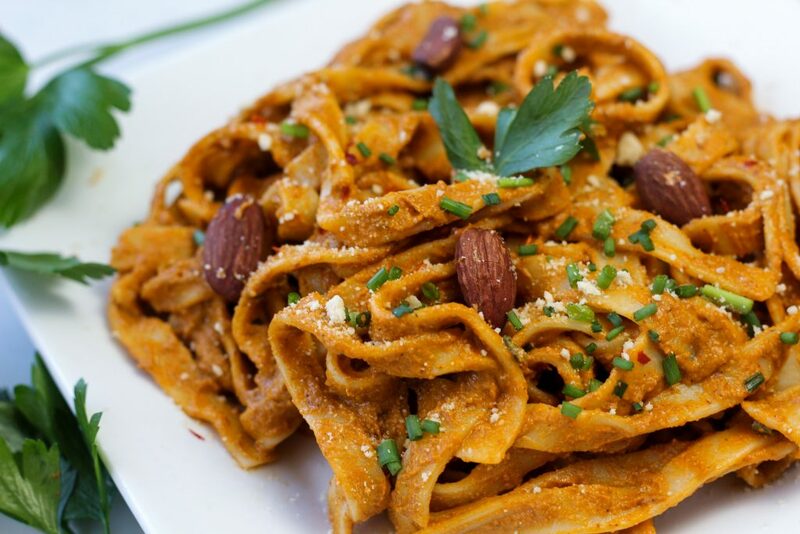 This butternut squash pasta with alfredo is such a good idea. 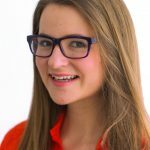 I store all of my favorite recipes or those to try on my personal cloud and this one is going there! 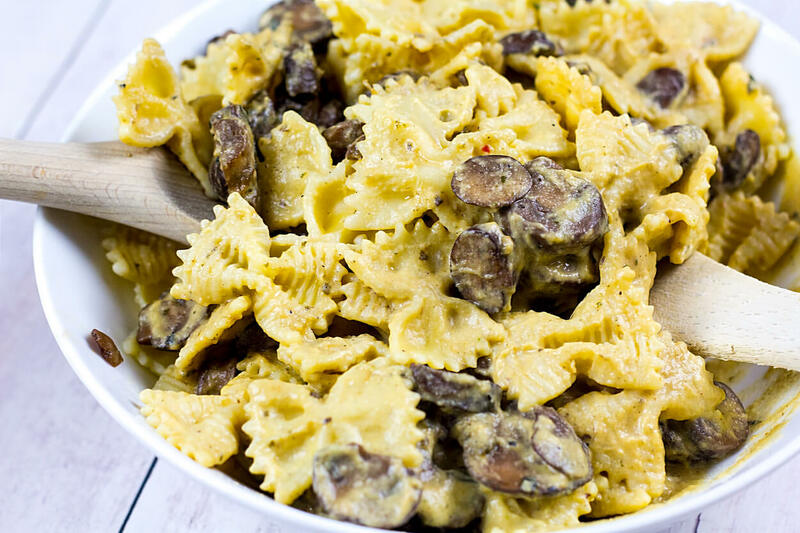 Any pasta with mushrooms is a good idea. Thank you, Dennis! Let me know how you like the recipe!